One of the most classic and timeless evergreen shrubs to grace our gardens and outdoor living space is Lavender. The simplistic elegance of its blue, purple and violet flowers together with its silvery grey foliage are a truly spectacular sight to behold during the summer months, in gardens across the globe. Did you know Lavender is both a herb and a member of the mint family, known as Lamiaceae? The origin of this therapeutic shrub dates back to over 2000 years ago when the Egyptians used it in their mummification process. In Renaissance France, washer ladies were known as ‘lavenders” as they cleansed the laundry in lavender and surreptitiously scattered the damp laundry over the local lavender bushes to air dry. In 17th Century England Lavender was used as a remedy for the Great Plague of London. Today Lavender is grown for commercial use in France, England, Italy, Australia, New Zealand, the United States and Canada. It is commonly used in perfumes, soaps and a spectrum of household products from cleaning materials to candles. The scent is also used to calm horses, promote ease of sleep and balance emotions to provide a general feeling of health and well-being. Lavender is also a celebrated herb for use in cooking, adding a subtle floral note to baking. 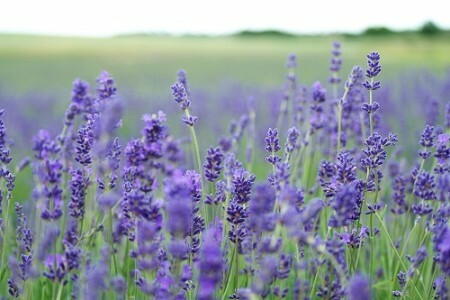 As a plant Lavender is easy to grow and maintain, thriving in fertile soil in areas of full sunlight and good drainage. The plants are hardy and will continue to grow with minimal tender, enjoying dry patches around the garden. With the prospects of a dry Summer, these perfectly formed shrubs will make the ideal addition to any outdoor living space. Not only does lavender look and smell attractive to us, but the flowers are also very attractive to bees and pollinating insects, making it perfect for pollinators . The French Lavender (Lavandula stoechas ) has a more open flower with deep purple flowers topped with bracts in pastel shades from pink through the purple depending on the variety. They look absolutely delightful nestling amongst a bed of roses. Or for a more moveable display, why not plant in one of our gorgeous ornate outdoor pots? Next Post: RHS Chelsea Flower Show!